Rakesh Jhunjhunwala believes that Nifty may cross 6200-6300 mark in 2013 after a long period of consolidation. He further added earning growth and strong liquidity will drive Indian market in latest interview on ET Now. We are herewith short excerpt from his interview. Why Indian Market will do well in 2013? 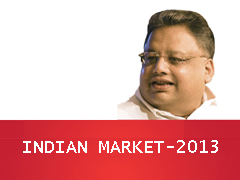 Rakesh Jhunjhunwala : Indian markets will do well in the year 2013 on the hopes of monetary easing by the Reserve Bank of India, the government’s intent to pass key reforms to boost growth and global liquidity. Despite all the pessimism, the market is performing extremely well with very good breadth and all technical indicators are extremely positive. Do you think we have all the ingredients of a new bull market in making? Rakesh Jhunjhunwala: We have two of the three ingredients. One is utter pessimism and the interest rate cycle turning. I do not know how good earnings growth will be. If earnings growth turns out to be good, then surely we could be at the beginning of a good market. Apart from earnings, what else could lead the next bull market? Rakesh Jhunjhunwala : What is more important in the earnings is the consistency of growth. If next year we get 15-16% returns and if by June, July or August, there is consensus that the year after will see another 15-17% rise, then the markets will perform very well. What will be next break out trading range? Rakesh Jhunjhunwala: I believe that market may cross 6200-6300, but crossing 6200-6300 is a long process. What is your short term and medium term view? Rakesh Jhunjhunwala: Nobody can be bearish. The market just refuses to correct. All technical indicators are very good, breadth is very good, 52-week highs are more than the lows. The market is growing up slowly. This is a rise which is not going to end in a hurry. Even a correction will take time. It is still some time away. So overall as per Big Bull Rakesh Jhunjhunwala market momentum will be positive and Indian Stock markets do well in 2013. We have to wait and watch to see that if this believes will turn in to reality or will be speculation only. You can read this full interview here.